The Hurva Synagogue ruin, photographed in 1980. The synagogue was proposed in the 1840s and built between 1854 and 1864. When it was dedicated in 1864 the name given was, “Beth Ya’akov”, but it’s place on the ruins, hurva, of the old synagogue stuck and it is popularly known as Hurva Synagogue. The 19th century Byzantine Revival structure was destroyed in 1948 during the Arab-Israeli War. Reconstruction began in 2000 and the synagogue was completed in 2010. 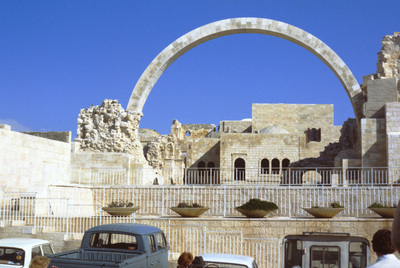 Smolski, Chet, "Jerusalem: Hurva Synagogue Ruins" (1980). Smolski Images. 719.